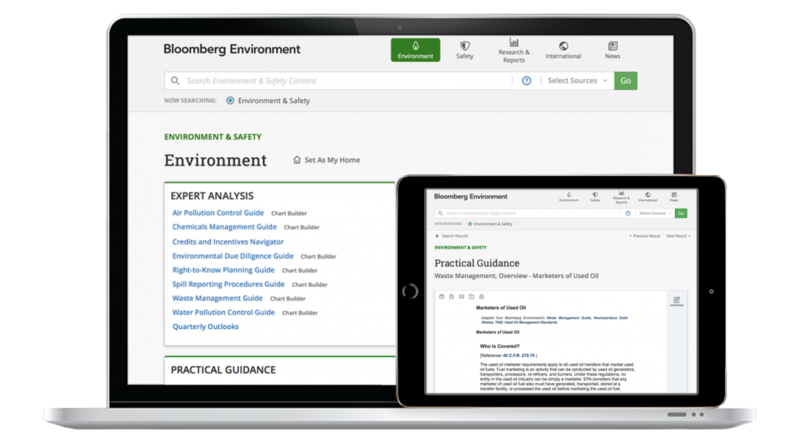 Bloomberg Environment is a powerful compliance tool offering news, analysis, the full text of laws and regulations, proprietary compliance tools, and more – all on a single platform. View related documents, access relevant full text citations, customize your updates, and more. Compare versions of regulations, contrast state regulations with Chart Builder, and stay abreast of proposed changes with news and alerts. Global EHS content, topically organized for easy searching. Improved search functionality and automated suggestions deliver tailored results, which appear by category. A collection of checklists, practitioner insights, and government guidance documents with easy links to all of these documents. View, sort, and download state and federal regulatory development reports. Regulatory custom emails link directly to sections affected by the rulemaking. Access previous downloads, research trail, alerts, and workspaces. Share workspaces with colleagues to promote collaboration. 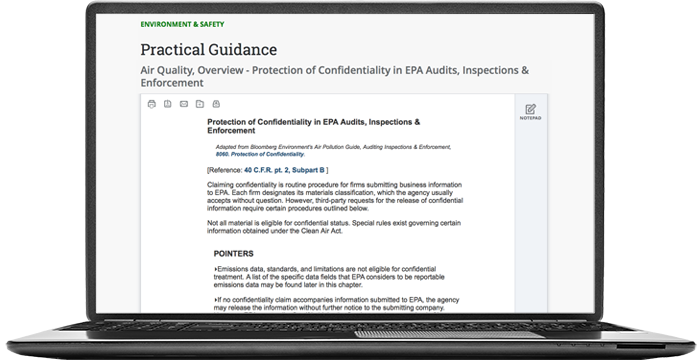 From resources that dissect chemical regulations to expert-written guides to workplace safety and more – Bloomberg Environment helps you navigate shifts in EHS rules and regulations with ease. 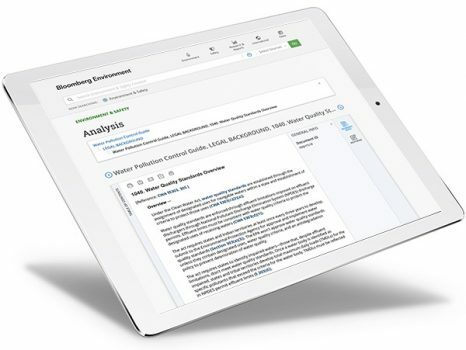 Discover all the ways that Bloomberg Environment can elevate and enhance your EHS program, with tailored resources for any size organization.